According to the Tax Foundation, it takes the average business filer 23 hours and $420 to meet the regulations of the federal tax code. With one of the highest corporate tax rates in the world—and high rates for small businesses—it’s no wonder many companies have stalled hiring and investing in expansion; there’s too much uncertainty. A continual rise in taxes makes it harder for U.S. companies—metals included—to compete, create new jobs and provide quality benefits. 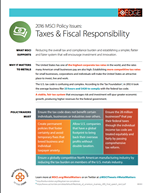 MSCI, along with partners in two coalitions—the Parity for Main Street Employers coalition and The Coalition for Fair and Effective Tax Rates—is working to push Congress to pass comprehensive tax reform. Learn more about MSCI’s stance and the key facts that support our position by downloading the cheat sheet. Share it with colleagues and lawmakers, and at Get Out the Vote events.